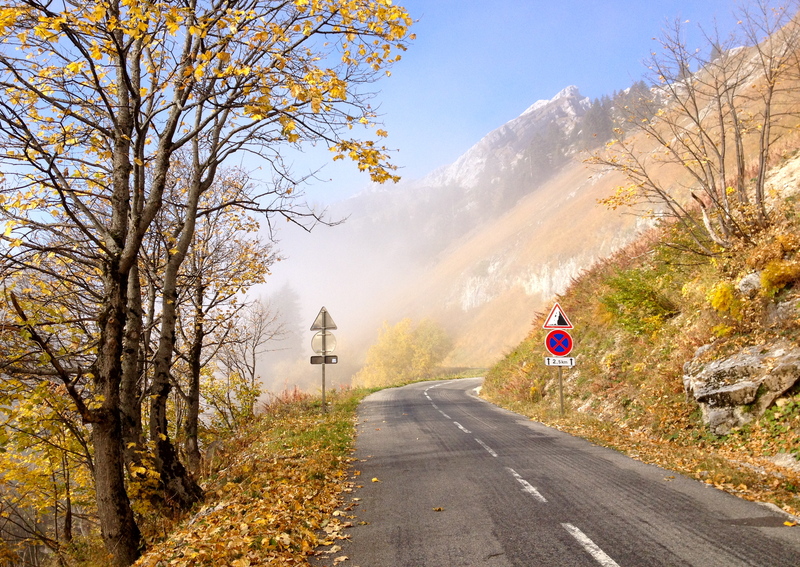 We’ve had snow on the ground for a week now, and I switched from riding to xc skiing 2 weeks ago, but I wanted to share another cycling adventure that I had back in late October: climbing the famous Col de la Colombière mountain pass in the Haute Savoie region of France. This was without a doubt one of my favourite days since we arrived in Switzerland, and one of my best days ever on a bike. I’ll keep the text short and tell the story in pictures and video. Back in late October I was keen to find at least one more big mountain pass to climb on my bike before the cold weather and snow moved in and shut most of the mountain passes down for the winter. 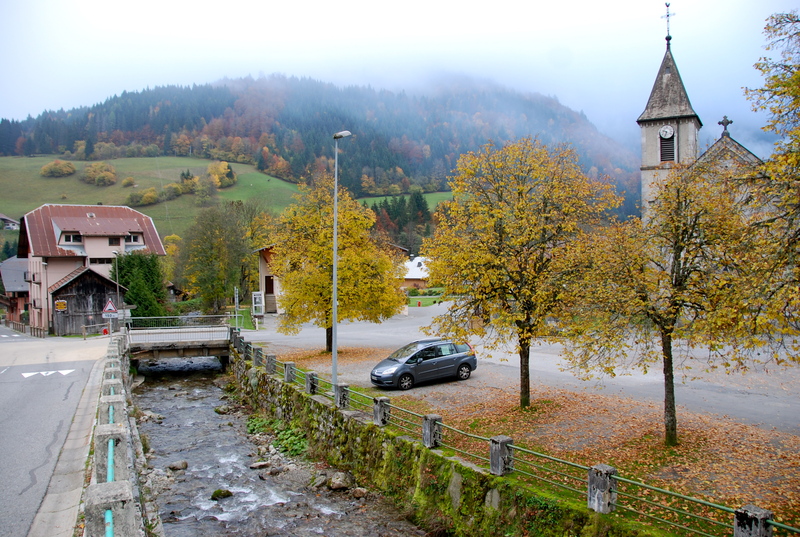 I had also been noticing (via webcams) that, while much of the Swiss plateau region where we live was shrouded in fog most days, the mountain passes and ski resort towns at higher elevations were enjoying a lot of sunshine and I was desperate for some respite. 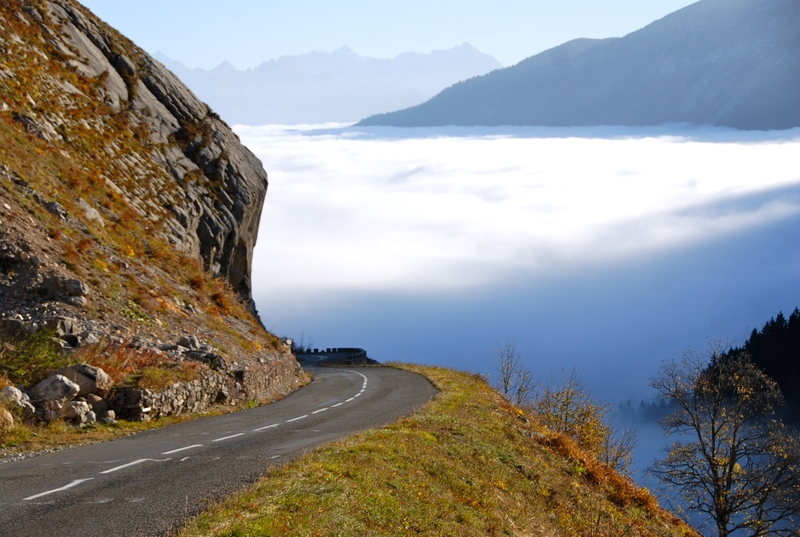 On the evening of October 23rd I checked the weather forecast (which was good) and made a plan to drive to the French town of Scionzier the following morning and ride the climb to the top of the Col de la Colombière (elevation 1618m, or 5308ft). 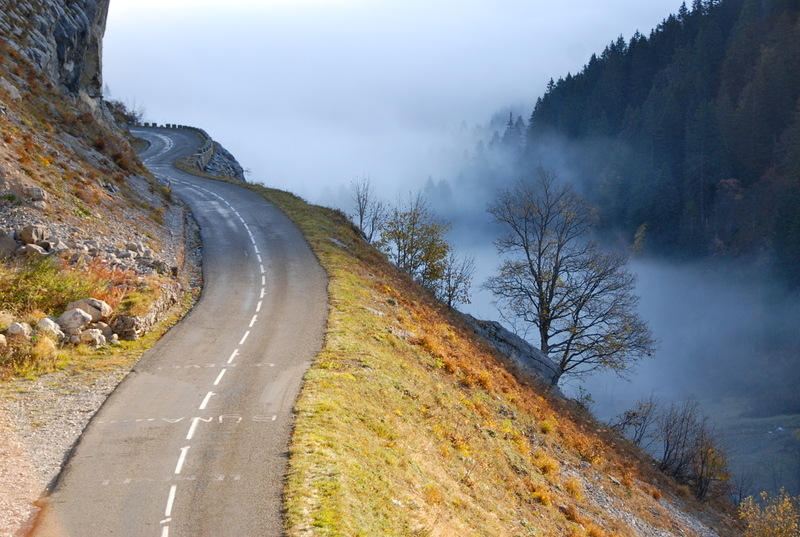 This Col has featured regularly in the Tour de France, having been visited by the peloton 20 times since 1960. 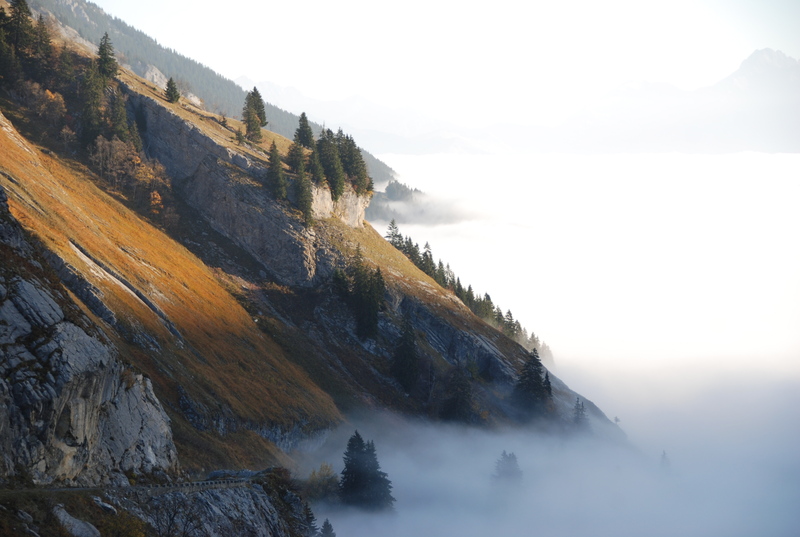 Looking down toward Le Grand Bornand, with much of the fog burned off. On the morning of the 24th I dropped the kids at school and made the 90 minute drive across the French border, going south via Geneva. 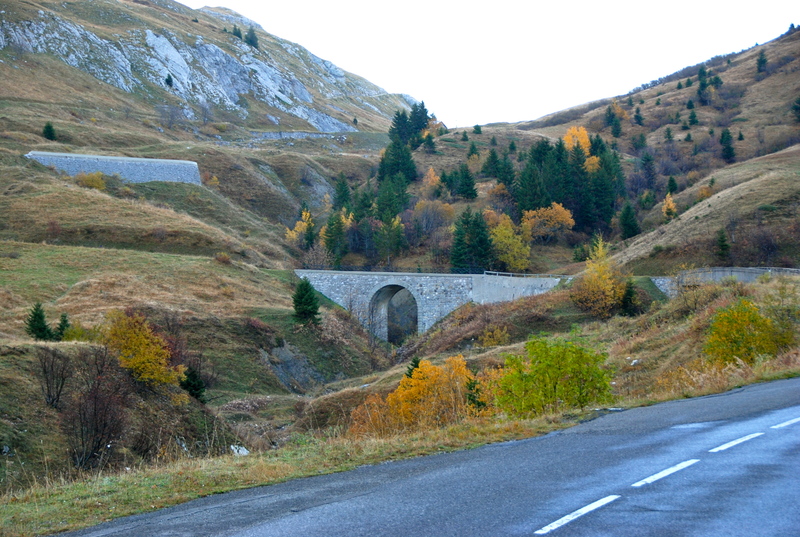 The Col can be approached via both Scionzier and the town of Le Grand Bornand on the other side, so I decided to head to Le Grand Bornand and drive over the pass by car to inspect the climb first. By the time I reached Le Grand Bornand I was beginning to lose faith in the weather forecast, as it was just as cloudy and foggy as in Lausanne. The climb to the Col from the Le Grand Bornand side (easier) is 11.7 km long and rises 690m (2264ft) at an average grade of 5.9%. As I drove steadily upward through thick fog, encountering a herd of goats along the way, I began to wonder if all those sunny webcam photos from the mountain resorts were just a hoax, and I worried that I would have to climb and descend the Col entirely in the cold fog (neither very scenic, comfortable, nor safe!). 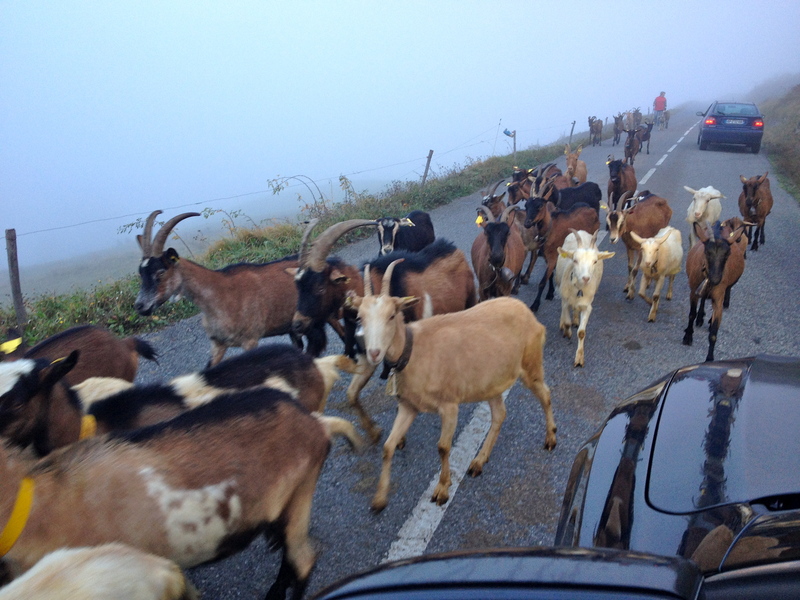 A mobile petting zoo suddenly came running out of the fog on the road up to the Col from the Le Grand Bornand side. Much to my relief, I finally emerged from the fog at about the 10km mark and drove to the top of the pass under clear skies. The views down either side of the pass to the valleys below were pretty spectacular, with the top of the pass in sunshine and the valleys filled with cloud. I stopped and took lots of photos before dropping down the other side to Scionzier and the start of my ride. 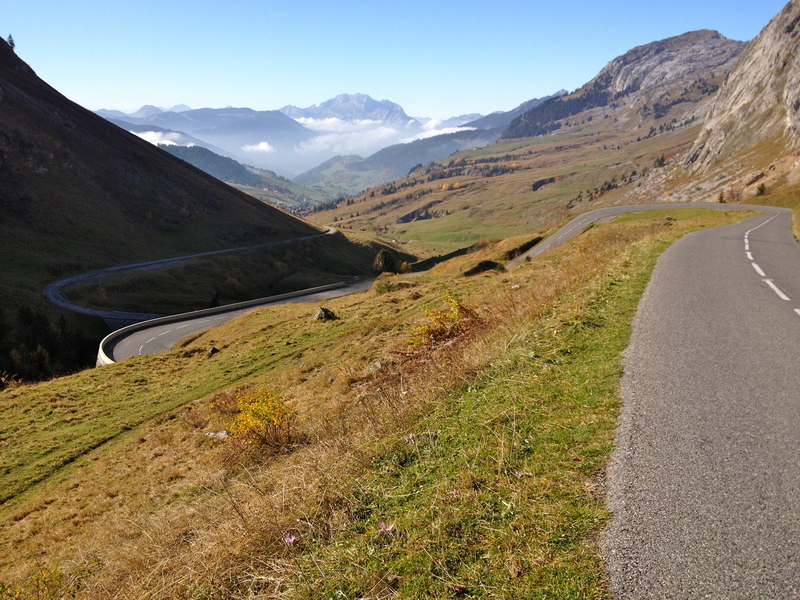 Looking up towards the final switchbacks to the Col on the Le Grand Bornand side. From Scionzier the climb to the Col de la Colombière is much harder, climbing 1108m (3635ft) over 16.3km at an average gradient of 6.8%, with the final 2kms kicking up to over 10%. Before setting off I loaded up on drink and snacks, as well as extra clothing for the descent, which I knew would be a chilly one. Village of Le Reposoir at about 9km, and just after coming out of the first layer of fog. The climb itself was pretty hard and it took me an hour and 12 minutes to get to the top. I built up to a race pace within the first few kilometres and then rode on the edge of the red zone until the final steep kilometre, which I rode at my max (ouch!). Much of the climbing took place in the fog, with two distinct bands, one below and one above the town of Reposoir, which I passed through at the 9km mark. It was only in the final 2 kilometres that I emerged out of the clouds and into the sun. Emerging from the second fog layer and into the sun, finally, with about 2km to go. The gradient is 10% all the way from here. 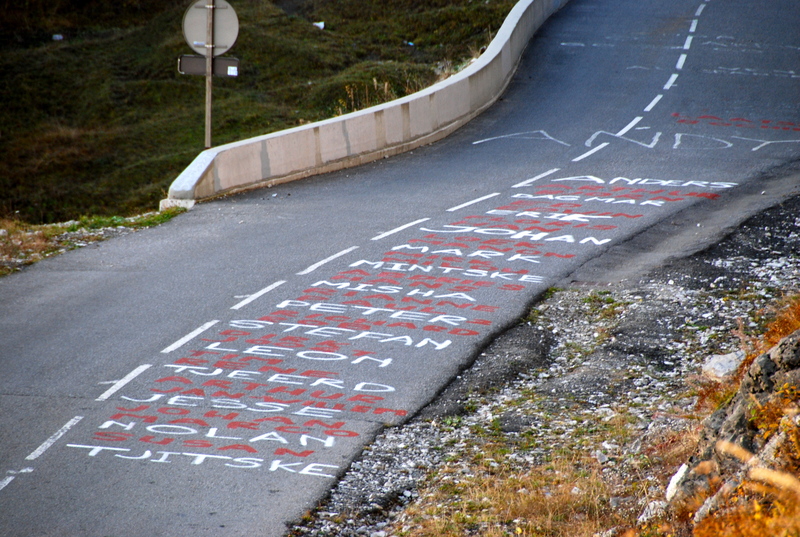 Rider names painted on the road near the top of the Col.
Once on top I stopped for more pictures and rode a short way down the other side to shoot a little video. 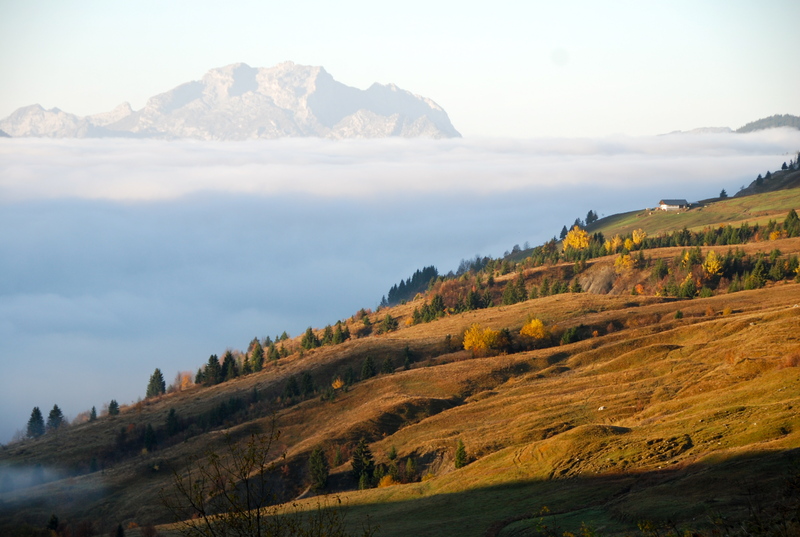 I was amazed at how much more one could see towards Le Grand Bornand, now that some of the morning fog had burned off. 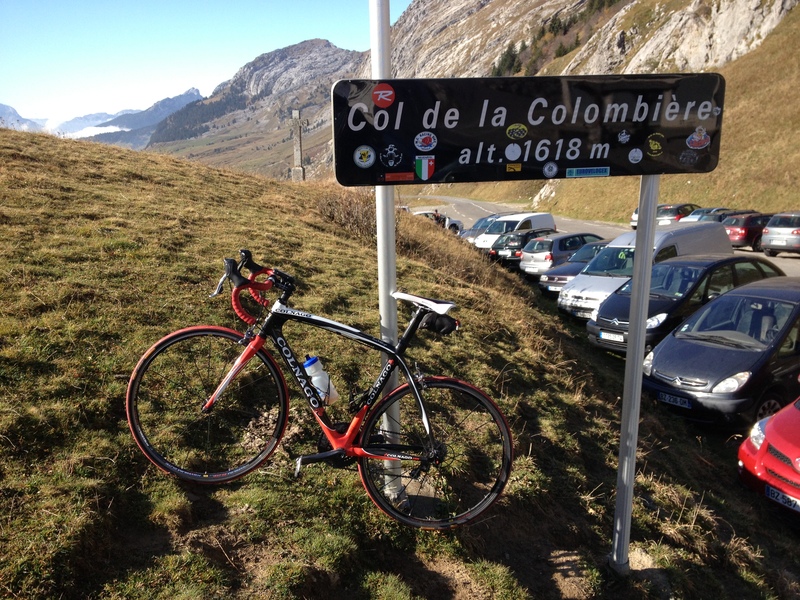 Col de la Colombiere, with the sun finally up! After a drink and a snack I donned some extra clothes and headed back down towards Scionzier. The trip back down was chilly, nerve-wracking, and slow. With the fog limiting visibility on the slick hairpin corners (with no guardrails), I found myself death-gripping the brake levers more than once! By the time I reached Scionzier a fine drizzle had joined the mist and I was shivering with cold. Thanks for taking the photo Mr. Tourist. Don’t quit your day-job! Fogline on the descent towards Scionzier. Still, none of this dampened my spirits. I was pleased with having done this famous climb, satisfied with a good hard effort on the bike, and had been delighted with the stunning and unexpected views from the top of the Col. Definitely one of my best days here so far. Check out the short video below.